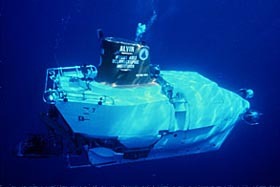 WHOI operates the U.S. Navy-owned Deep Submergence Vehicle (DSV) Alvin as a national oceanographic facility. A typical eight-hour dive takes two scientists and a pilot as deep as 4,500 meters (14,764 feet). This high-tech mini submarine is 23-feet (7 meters) long. Woods Hole Oceanographic Institution (WHOI) operates the US Navy-owned Deep Submergence Vehicle (DSV) Alvin as a national oceanographic facility. A typical eight-hour dive takes two scientists and a pilot as deep as 4,500 meters (14,764 feet), a depth capability that encompasses 86 percent of the seafloor. When working at maximum depth, it takes about 1.5 hours for the sub to reach the seafloor and another 1.5 to return to the surface. The five hours of working time on the bottom are crammed with carefully planned photography, sampling, and experiments conducted by the scientists using three 17-inch and two 12-inch diameter viewports. Alvin can hover, maneuver in rugged topography, or rest on the bottom. Typically, four high-definition video cameras are mounted on Alvin�s exterior. Because there is no light in the deep sea, the sub carries a suite of LED lights to illuminate the bottom. Two hydraulic robotic arms manipulate sampling and experimental gear and retrieve samples. A sample basket mounted on the front of the sub carries a variety of instruments that includes sediment corers, temperature probes, water samplers, and biological sample boxes. Scientists using the sub can load up to 400 pounds of gear in the basket. Alvin is especially useful to such observational sciences as biology and geology, but marine chemists, physicists, and engineers are also among its users. The sub is probably most famous for locating a hydrogen bomb accidentally dropped into the Mediterranean Sea in 1966 (two years after the sub's delivery to Woods Hole), for its exploration of deep-sea hydrothermal vents first discovered in the 1970�s, and for its survey of the sunken ocean liner Titanic.